Bright Future Global Tours is firmly committed to win-win travel which enriches both tour participants and host communities by promoting greater cross-cultural understanding, appreciation and dialogue. BFGT works with local artists and artisans, small businesses, cooperatives and collectives, human rights activists and environmental groups in providing fun, inspiring and responsible small group tourism. A portion of the profits from each tour is donated to community projects. Bright Future Global Tours believes that global interpersonal connection and creative initiatives by peoples of all nations are key to a brighter future and to greater personal and collective happiness. 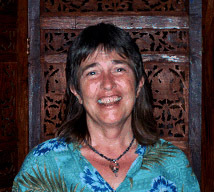 Louise Wisechild, PhD is the founder and primary guide for Bright Future Global Tours. She is a lifelong solo and group traveler who first began her travels when she was a high school exchange student to Australia in 1970. Since then she has traveled to Bali, Thailand, Mexico, Guatemala and Europe as well as throughout the US and Canada. Before starting Bright Future Global Tours, Louise led tours to Oaxaca, Mexico, for the Day of the Dead and with GATE to archeological sites around Mexico City. Louise is also the author of several books, including The Obsidian Mirror and The Mother I Carry. She has written numerous articles including travel articles about indigenous healing and essays which promote local economy and global understanding. She earned a PhD in Creative Arts and Communication (2000) and has a lifelong passion for social justice and individual and collective healing. She has extensive experience in leading enjoyable and inspiring small groups and has lectured and taught internationally. Deeply committed to learning by experience, Louise has worked as a university professor, counselor, columnist, writing teacher, massage therapist, elder caregiver and jewelry designer. Bright Future Global Tours combines her enthusiasm for beauty and people with her belief in the rejenerative nature of travel and creativity. 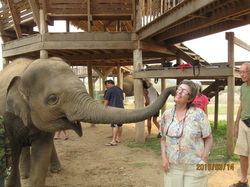 Message from Louise Wisechild about the importance of small group, responsible tourism.